Minitokyo »	Goto-P Wallpapers » Goto-P Wallpaper: .My.Hidden.Secret.Lake. well, maby try making the BG like... not all black and dark blue, maby try blue and dark purple, or red and blue...i dunno... im not very good with color choices, experamenting always works. This is awesome! I love the effects at her feet and the colors are wonderful! Excellent job! 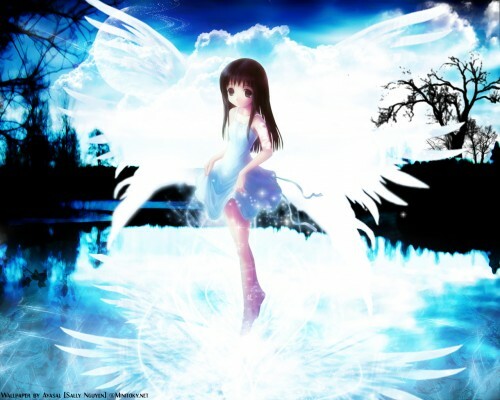 nice walpaper, charas wings and the effects are nice, though her wings don't fit in that well and it doesn't look like they would be from the chara then the treeas look blury, well i like the sky with the clouds there. I think this is really a beautiful wallpaper. The colors look great and I can see that you put some effort in it. The bg is really beautiful. I just think this little sparkling in front of the moon or planet doesn't fit. very beautiful. I really love the background since it looks really amazing. the wings look cool and the water is pretty. the sky looks great and the tattoos on her look cool. Great Work! HMM...ayasal-san change ur style aready? and i like the background color...very smoothly. I really like the blending of light and dark in this wallpaper. Great subject and setting. I think the trees should have been a bit sharper since the clouds are sharper or vise versa. The background elements do not blend well because of that. Overall, great job! I thing that the brightness on her feets make the wall look great....the only thing that doesn't match are the wings....if you can call them wings....i can't distinguish the sky and the clouds cuz of her really bright wings. well first I wanna recommend you to try blurring the right side trees a little bit so they can match with the left side trees! and about the wings well they look good for me and they fits along with the character! the water looks marvelous really all the reflections and the ripples are done well! keep up the great work Aya-Chan! Hey there! The trees on the left look a bit blurry but GREAT job with the wings and clouds. The other patterns found in the background look nice too. This is a really nice wall. I will admit that I'm a bit of a sucker for angel-type walls. I would suggest trying to stick with either a soft or crisp image in the wall. The crisp clouds above her head and in both lower corners don't go all that well with the softer, fuzzier center. Personally, I prefer a crisper image, but consistent at least in zones is also good. The hard swirley stuff on top of the moon could use some work as well since it reminds me of the spray can in paint =_=;; (don't kill me). Besides that stuff it's a really neat wall.